I'm more inclined to post words today than photos. This past Saturday's performance on Virtually Live by Anek Fuchs spoke for itself but what struck me as most significant were some off-the-cuff remarks he made. Set those in the context of the just days passed half-birthday of the Virtually Live Events project and you get Surreal in hyperverbal mode. 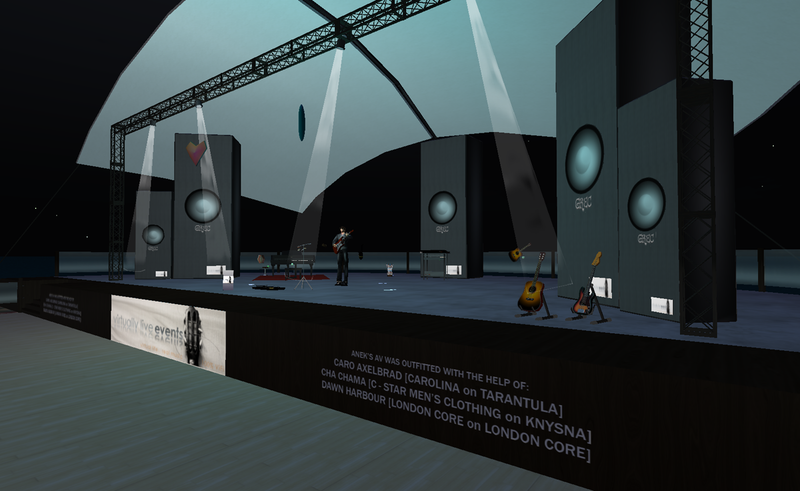 Anek paused late in his set to thank Openlife for hosting his performance, commented specifically on some technical glitches he had been observing on our venue (thanks! ), and then generally stated his pleasure that he could now perform on this grid because when he made an av here over a year ago, the platform was unable to support live events reliably, whereas today it can. Anek's comment was important because it was unsolicited, honest, and accurate. Everyone who hosts events shares the same spiral of questions: "will people come?" "if they come, will they stay inworld?" "if they all stay inworld, will the region crash." "if the region crashes, will they come back?" "if they don't come back, will the performer ever return for future events?" and so forth. Music-based events are resource intensive, in particular, and so many things can go wrong. You have a music stream, the scene itself including animations and other scripted objects, and the audience with the added complexities of their customized avs. One great thing about our community is that event hosts generously share hints, tips, and everyday wisdom so that all events can benefit from lessons learned. I have been in Openlife since July 2008. There was absolutely no way you could have held events on the scale of or with the reliability that Virtually Live Events and other hosts do today. You could not have done this a year ago. But inexorably during these last twelve months, this grid has turned the corner on stability. For anyone interested in numbers, VLE's maximum avs simultaneously on region for all events has ranged from 19 - 32. Several of those events exceeded 25+ avatars for two hours continuously and several more exceeded 20+ avatars for two hours continuously. 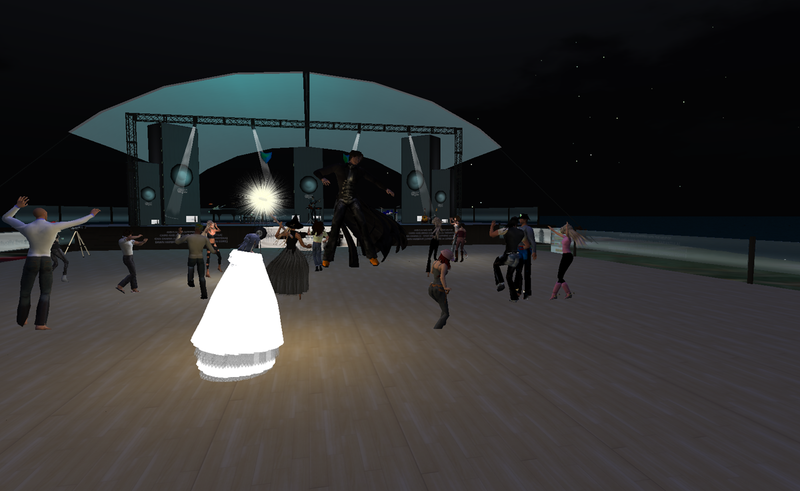 While it is always the case that some avatars need to relog during events, the region stayed alive and the performance continued. Those are undeniably healthy numbers and a compelling metric for evaluating platform stability. Anek is one of SL's most sought after performers and he has a particular combination of artistic temperament and attention to detail that I knew we had to take seriously if Openlife's development was to make a sufficiently positive impression on him. I want to thank everyone for helping make his time on Openlife a pleasurable and positive experience. He has stated enthusiastically that he would like to come again to perform. At least, I'll have some time now to prepare fire extinguisher props; the guitar was in flames when he left. P.S. Click on images to see full-sized photos. Enjoy!